The Bronze Age was the beginning of empires on Earth. Political and cultural units larger than just one settlement started appearing anywhere people can live. Larger cities happened. Trade between them became essential. And with trade the empires spread further. With Bronze you get the chance to spread your own Bronze Age empire, not in a big, complex civilization builder but in a quick, streamlined game with simple rules but complex decisions. Everything you do seems trivial, but there are many consequences attached to your choices. You only do two things on your turn. First you pick a technology cards and place it in your grid, then you place one or more cubes on the modular game board. Just forget that the technology cards do not all represent technologies – unless the definition of Authority has changed significantly since I checked – and mostly do not originate in the Bronze Age. We’re not hear to nitpick, and the technology a card represents doesn’t matter, anyway. What matters is what you can do with a card. 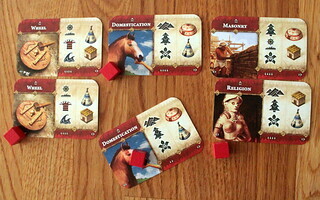 Each card shows two or three of the seven terrains, and two or all three of the types of settlement. When you activate a card you may place one of your settlement cubes on a spot matching both things. Activating a single card is not fun, though. Not if you can activate a bunch of them. That’s why you have a grid of cards. When you pick a card for your turn you place it in one of the grid’s four columns. Then you not only activate the new cards but also the cards to its left and right, and all cards in the same column representing the same technology. For each of those cards you may also place a cube. Bronze Casting is a special technology, a wild card present on the back of all technology cards. It lets you place a cube anywhere, but doesn’t activate other Bronze Castings in the same column. The second part of your turn is placing those cubes. Time to look at the board. 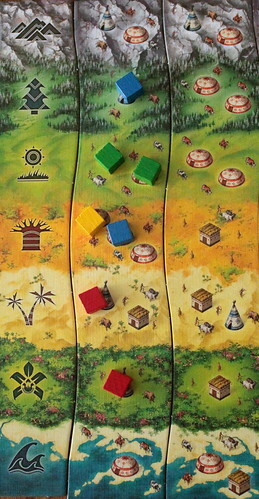 The board is build randomly from column tiles called provinces. Each province has the seven terrains in the same order from top to bottom. At the intersection of a province and a terrain you have from one to three spaces for settlements. Each activated card lets you take one of those spaces somewhere. Where to take spaces is where Bronze gets really tricky. For each province there is a majority scoring. Whoever has the most settlements gets the points. For each terrain you can score points for trade routes, uninterrupted lines of settlements of your color. An empty spot does not interrupt your trade route, only a settlement of a different color does. You get points for trade routes at three settlements, at five, and at seven. Putting an interruption into an opponent’s six settlement route is so much fun. Neither building trade routes nor interrupting them is quite as easy as it sounds. The one restriction in where you build settlements is that you can only ever move eastwards. When you have a settlement in a province you can never again build new ones in a province west of it. Players going slowly have some benefits, their trade routes can not be interrupted by anyone and they can easily pick up province majorities. Lagging behind also lets you see what you’re getting into. New provinces are only revealed when the first settlement is built on the one before, until then you don’t know which types of settlements can be built. Balancing the advantages of lagging behind is the final important feature: city cards. When a player builds their first settlement on a new province they pick one of the city cards there. All city cards are worth points, but they have conditions. Points for having the right technology cards in one row, or one column. Points for having the most settlements in a terrain. Points for having the most settlement markers left when the game ends. Or the fewest. Getting there first gives you the choice between all of them. Come later and you have to take what’s left. Is going fast better than lagging behind? It depends. Is a province majority worth the effort? Depends. How about building that five space trade route up into seven spaces? It depends. But surely interrupting an opponent’s six space route is good, right? You guessed it, it depends. The thing about Bronze is that you can’t do all of those things when you want. Or even most of them. If you charge East you won’t have the chance for that province majority. If you take the majority you have fewer choices of city cards next turn. If you interrupt a that trade route you give your opponent a turn and a reason to interrupt yours. You can do more of those things at once placing more cubes per turn. But to do have more cubes you can’t play Bronze Casting and will have to place a cube where the technologies allow you. All you do is pick a card, place the card, place some cubes, but each of those actions gives you some things you want and takes away many opportunities to do others. And mostly what you get and what you lose only comes from your decisions and those of your opponents. There is some randomness with available cards and the spaces you find on new provinces, but for the most part your success depends on you. The player interaction in Bronze is in a very good place as well. You’re in constant competition for everything, and you can and must block your opponents from their opportunities. You can’t, however, destroy what they built, and you can’t maneuver them into a corner where they can’t act. In many ways, Bronze reminds me of some of Stefan Feld’s games. Every decision is agony because you’ll never get everything you want. You’ll actually get very few of the things you want, and you have the constant pressure of never being able to go backwards. Bronze is a simple, quick game with many, tough decisions. Kingpin is a two-player strategy game about crime syndicates at war: with limited time, space and people you try to overrun the enemy’s HQ or take control of the central No Man’s Land. It’s not as easy as it sounds, there is more thinking involved than you might expect.